Bubble tea originated in Taiwan back in the 1980s. Since then, the chewy tapioca balls have become a favorite treat throughout California. Also known as boba, pearls, or bubbles, bubble tea comes in a variety of flavors from fruity and refreshing to dark and rich. You’ll find some combinations with dairy, some without. 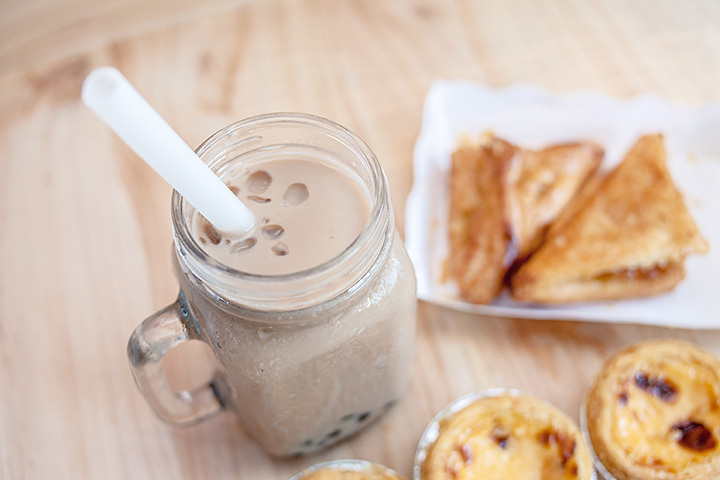 Here are the 10 best places for bubble tea in California! Boba Guys is the result of two guys bonding over a love of boba and wanting to bring it to their new hometown. Using locally-grown ingredients makes the Boba Guys are truly special place to get bubble tea. You can get your boba hot or iced, made with traditional Asian flavors or with California flavors like horchata. Tpumps has several locations in both Northern California and Southern California. The popularity of the place comes from the vast variety of flavor selections and different ways that you can customize your boba, ranging from the sweetness to the boba or seeds that you add to the drink. Class 302 is a unique boba shop that offers serve yourself boba—like self-serve yoga. You can experiment with different flavors of drinks and boba as well as enjoy fried snacks and shaved snow—another favorite. If things are too sweet, then try adding an unsweetened tea. Roasting Water takes pride in using only fresh fruits and freshly brewed coffee. In addition to different types of boba, you can add seeds, aloe, jelly, pudding and other additions to an array of teas, smoothies, and other hot and cold beverages. Bubbly Tea House is a family-run business that uses fresh ingredients and offers reusable glass bottles to bring your boba on the go. There’s also a couple of gaming stations in keeping with its location in the Silicon Valley area as well as a vast variety of flavors to choose from. Dingle Berries Coffee & Tea isn’t just a funny name. They also make funnily named drinks, like Dirty French Maid and Something About Mango—and others that are likely NSFW but fun to order nonetheless. You can also find gold leaf macarons and fried PB&J, amongst other snacks and sweets. The latest trend in bubble tea is known as cheese tea—bubble tea topped with sweet and sour cream cheese for a new riff on milk tea. Little Fluffy Head specializes in cheese tea and brings the delicious creations all over the city. Choose from a variety of flavors to enjoy in the café or get it delivered. Labobatory fuses boba with a new wave of trendy and cool ingredients ranging from Nutella to cookies. Choose from drinks with cool names, made with real fruit or try something creative. Each drink has its own special maker and you can choose from boba or other additions like pudding or jelly. Pleantea began when a Chinese expat discovered that boba in the States wasn’t up to par. Pleantea uses only fresh ingredients and goes the extra mile by making drinks sustainable and offering them in reusable bottles. Using artisan teas, choose from traditional blends and other flavors. San Diego Boba Tea is a family run boba shop that serves up a lot more than just boba. The shop offers discounts and a rewards card as well as much more than just boba. The local shop is a favorite and also features a variety of Asian style sweets such as honey brick toasts, waffles, macarons, mocha and more. Boba drinks are topped with everything from cereal to more traditional boba add-ons for a unique spin on the drinks.